Reclaim Your Time – Focusing On What Truly Matters is your number one motivational video course to get you jumping out of bed with vigor and a plan of action. The window of youth is small. The window of life isn’t all that much longer. And the number of hours in a day are very short. Life goes by quickly and if we don’t make it count, we’ll be regretting the day when we no longer are able to do those things we dreamed about. That’s why it’s so important to make every day count. You came into this world not just to be another statistic but to make a difference. You might not be dreaming of becoming a superhero but you surely want to be able to be the best version of yourself. You want to be successful. You want to have great relationships. You want a large friend circle. You want to be fully healthy and happy. But you need to put in the effort to attain these things because they don’t simply fall into your lap. If you want to be successful, you have to put in the hours to study, learn and build. Whether you’re looking for a job promotion or building your own business, you have to put in the effort. If you want to stay healthy or become healthier, you have to put those hours in the gym. If you want better relationships and friendships, you have to work on yourself and increase your magnetic charm so that people will want to be around you. Again, that takes some effort unless you’ve been blessed from birth. Regardless, we can all make ourselves so much better in anything and everything that we do if we put the time in. 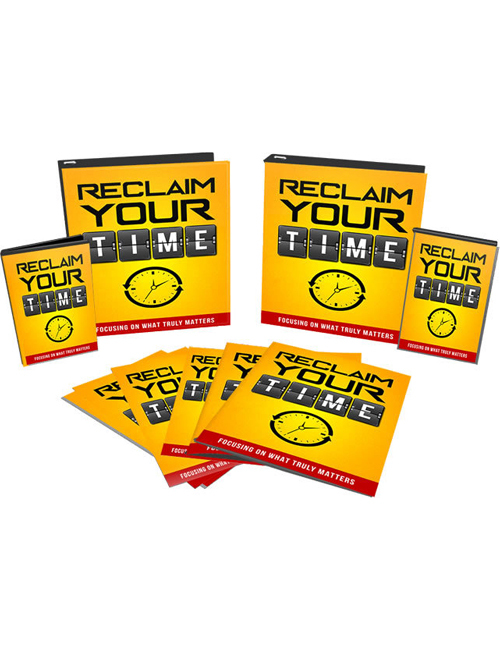 In this video course which supplements the Reclaim Your Time Ebook, you will learn fully about how to manage your time and how to be more productive. You’ll discover how to get things done in less time, how to become more successful, how to be more influential, how to find purpose in your life and create your legacy, how to be much more positive and motivated and much more. We all have it within ourselves to be great but often we don’t realize it. This video course will help you to find that within yourself. This is one course you definitely want to get a hold of. Get it now.